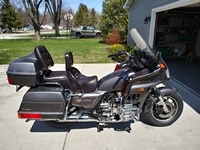 I am very new to the goldwing family. I have an 84 1200 and I noticed that it makes a popping sound when running in second say down a city side street. It doesn't do it when I pull the clutch in or when I give it gas..
Just when I am running or decelerating. Again I am new to all of this.. I am no expert but I think I am going to change the plugs first. Has anyone else experienced this? If so am I on the right track to fix it? Thanks... I talk to a guy that sells gold wings and he has an 84. He says they come from the factory like that and will do it when I am in that range of rpms. 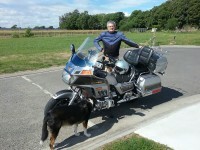 Welcome to the site and the Goldwing family. Do a quick search in the forums about Seafoam. Run a few tanks of gas with this in it. Also before you change the oil run a half a can through the engine gently (ride without gunning it) for about a hundred miles to clean out the gunk, then change your oil. Your clutch, stater, and engine will love you for it. You will see a difference. Also be sure to check out the How Tos section of this forum. There is some very useful info for anyone wanting to learn about servicing their own Wings. Have fun and feel free to ask anything at all or PM if you want.